Discussion in 'Iowa Long Beard Conference' started by zvholk, Apr 16, 2019 at 2:37 PM. I’ve been watching this bird for about 3 week now. Every time I drove by he was out in the field strutting his stuff. On opening day I had high hopes that I could get him right into my decoys. At fly down 3 jakes came right in but he stopped short at 30 yard not offering a shot. I was kicking myself for passing up on a shot at a jake, but I had the Tom on my mind. 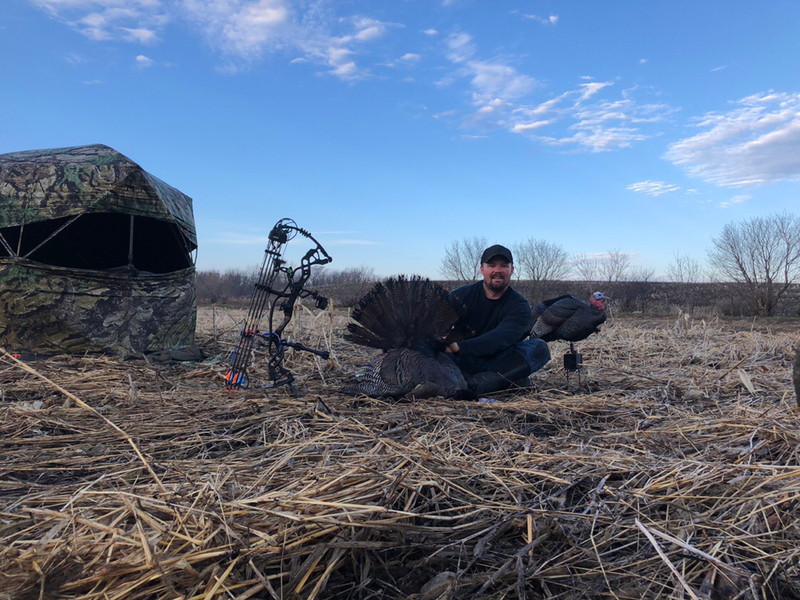 Latter that afternoon I set up in the same spot to try and get him as he made his way back to the roost, but instead he stayed clear on the other side of the field for more the 4 hours till he went to roost in the other tree line. I watched him from the road most of the week and was excited that he was sticking around. Saturday morning came and I was going to setup right where I had watched him on Monday, but of coarse he never showed himself. This morning I decided to take a couple hours off work to try again before the rain came in for the next 3 days. I setup in the same spot I did Monday morning only to have him gobble in his other roost. I said to myself “you have got to be kidding me!” But it worked out good because there was 2 hens that flew down and I was between them and the Tom. He came out into the open about 200 yards away. I started to move my DSD a bit and that’s all it took, he was in front of me in no time. I had a hard time taking pictures by myself, this is the best one I got. muddy, cybball, Rjack and 4 others like this. Congrats! Taking a picture by yourself is a pain. Usually I'll use the voice activation on my phone, but last time it must've been too windy for the mic to pick up my voice. I had to take a video and get a "video capture" from the video. Hard to keep a good turkey hunter down!! Congrats!! Are you doing the voice activation with Siri? I have android. It's worked in the past, but the wind was really gusty last Friday.